The cover of CARNIVAL features a scene from Wade Shows in 1946 and Down Memory Lane shows the same picture at night when the midway was ablaze with lights. Drew Exposition fielded the midway at the fair in Hickory, North Carolina, bringing in the show’s new 145’ Mega Drop tower ride. Plans are being implemented to bring some new changes to the midway in 2007. Deggeller Attractions, which began their season in Florida and at their “hometown fair” in Stuart, Florida, had a number of obstacles to overcome just getting out of the starting gate. It was time to Rev Up the Fun on the Butler Amusements’ midway at the Southern California Fair. Powers Great American Midways has signed a contract to provide the midway for a second year at the North Carolina State Fair. North American Midways Entertainment (N.A.M.E.) brought several new rides to their midways; offered their “Marriage on the Midway” promotion for a second year; and worked to bring wireless mesh technology to fairgrounds. Safety programs have been scheduled for the IISF Trade Show in Gibsonton, Florida, in February. Tropical Amusements and Shaw and Sons were two of the carnivals bringing midway fun and thrills to Western Pennsylvania. In the ongoing series History of Train Shows, Noble Fairly, Max Goodman, and Dave Stock were all involved with the traveling outdoor amusement industry and had roles in several of the train shows that brought midways to the nation during the 1930s and ‘40s. Manufacturers Showcase highlights Ital International’s online newsletter, and the offerings of skill game supplier Red Bone Products. State Fairs are like a rite of passage for the carnival industry. In the fall these events showcase not only what a state has to offer, but the midways also show what carnivals have to offer. The Utah State Fair put the spotlight on food and brought in the Mighty Thomas Carnival for midway fun. Crabtree Amusements was a new midway provider at the Colorado State Fair where safety was also a priority. At the Nebraska State Fair, Mighty Blue Grass Shows had a "Stay and Play" promotion for those seeking thrills late in the day. The Nevada State Fair relies on volunteers and teamwork to bring in the fun and the new midway provider, California-based Paul Maurer Shows, showed they were definitely a part of that team. At the Wisconsin State Fair, Murphy Brothers and Reed Expositions put the fun into the fun zone. The fair is also noted for its monster-sized cream puffs, which celebrated 82 years at the annual event. Once again at the "Great Minnesota Get-Together," a successful independent midway attracted a variety of the newest as well as the best classic rides, along with host of food concessions and games. An American carnival that has been around for a number of years is the Mighty Thomas Carnival. Review photos of the show from twenty years ago in Down Memory Lane. While the Canadian Wall does not mean an international border, it does refer to the classic attraction known as the motordrome. Under new ownership, the Canadian Wall is still hitting the American carnival scene and casting about for some new venues as well. Manufacturer's Showcase put the focus on Sellner Manufacturing's new Tilt-A-Whirl that was delivered to McDonagh's Amusements at the Minnesota State Fair. It also features Fabbri Amusements' new Chopper Hopper and spinning coasters; and Gold Medal Products has put new emphasis on caramel corn. Do You Remember profiles a combination slide and play area that was fabricated by Man-Co Manufacturing. There is a new kiddie ride operator starting up in Virginia; Kiddie Amusement Rides LLC has been formed by John Clem IV and is ready for action in 2007. Need a place to book, check the On the Road section, which lists the locations and dates for several dozen carnivals throughout October. GREAT GIFT IDEA - A SUBSCRIPTION TO CARNIVAL MAGAZINE! It comes in everyone's size and color! CARNIVAL magazine offers its 2006 Industry Buyer's Guide, a comprehensive directory listing hundreds of businesses that want to do business with those involved with the traveling outdoor amusement industry. Information includes company name, address, phone and fax numbers, e-mail and website addresses, and a brief product or service description. The keep-all-year-resource! Marketing is a key component of business for the Jules & Beck Combined Shows. The force behind the carnival, Pat Guthrie, has been around since the mid-1960s and uses experience to continue the show's growth path. Louisiana-based D'Heilly Rides stays mostly in that state, but make a foray into Texas for the annual Schulenburg Festival. The conclusion to the Chronicle of Wade Shows brings the carnival up to current bookings, including its new Florida dates, and some of the personalities that have been involved with the show. The History of Train Shows follows the Endy Bros. Shows in the 1940s and some of the midway attractions of the time. Do you remember features two Bumper Car buildings that were offered by Export Sales Corporation, one manufactured by Floyd & Baxter, and the Italian import the Pavilion. One of the more successful rides appearing on midways this year is the SBF Traffic Jam. View how three American carnival companies have made modifications to the ride. Down Memory Lane reviews South Carolina-based Childress Shows. Photos of the midway offered by Helm & Sons Amusements of Riverside California are seen in the Route Snapshots. While the name is the same, there is a new Century 21 carnival providing midways primarily in Texas. Under the ownership of Kevin and Alan Exum, the carnival is playing their debut season in 2006. "Down Memory Lane" features Smith Wonder Shows, which billed itself as "America's Brightest Midway." With over 65 rides, 61 games, and 26 food concessions, Ray Cammack Shows provided the midway thrills at the annual Houston (Texas) Livestock Show and Rodeo. Hoopla abounds on the Smokey Mountain Amusements' midway with show owner Billy Clark celebrating 50 years in the outdoor amusement industry. This colorful show owner has been there and done that! "The History of Train Shows" follows the World of Mirth Shows in post-war America. Find out what a "hat show" was, and who were some of the unusual individuals who plied their trade on the midway. Super-sizing is not new to the traveling outdoor amusement industry, and an example of this is covered in the "Do You Remember" section with the Super Round-Up. "Manufacturer's Showcase" puts the spotlight on Eli Bridge's classic ride the Scrambler, and on a new selection from Rides-4-U, SBF-Visa Group's Traffic Jam. "A Chronicle of Wade Shows" covers some of the rides that Frank Zaitshik has acquired over the years, including several Eyerly pieces, as well as the start of the carnival's 2006 season in Florida. Route Snapshots features photos of Wright's Outdoor Amusements at a date in Texas, and K&B Amusements providing the midway at a festival in California. It was a different kind of gold karet that spelled success at the Annual Carrot festival in California where Butler Amusements hosted the midway. The carnival then went on to play the Date Festival in Indio. Ingenuity was key for Art Gillette, Castlerock Shows, who devised innovative means to help an installation artist create a display for a museum in Massachusetts, utilizing a number of carnival rides. North American Midway Entertainment (N.A.M.E.) is offering the Monster House attraction in conjunction with an animated film of the same name, on several of its midways this season. . Tons of Fun Shows had a bit of rough going when flooding over drenched a fairgrounds in Pennsylvania. Down Memory Lane features photos of Century 21 Exposition, which claimed to be the "World's Largest Motorized Midway." Do you remember profiles the Schiff Roller Coaster. The company promoted it as the most complete roller coaster ever built and both park and portable models were available. Manufacturer's Showcase spotlight's Gold Medal Company's new Lock-n-Go handle cotton candy machine, a design geared an easier setup. There is a double serving in the Concessions section with two articles on individuals; one who works as a Drown Clown, and the other who manages a Bobo dunk tank. Route Snapshots offers photos of two California-based carnivals in action: Schoeppner Shows and Christiansen Amusements. Crabtree Amusements provided the midway at the Annual Star of Texas Fair and Rodeo in Austin. The event spotlighted the return of several rides to the midway that had undergone extensive refurbishing during the off-season. In the Concessions section, concessionaire Adam McKinney is profiled. The family has been involved in the business since 1927 and two members, Adam and his dad, have served as president of the National Independent Concessionaires Association (NICA). Ray and Joanne Prowant, Durant Amusements, have been a part of the outdoor amusement industry for over 50 years. The couple was honored earlier this year by being inducted into the Ohio Fair Manager's Hall of Fame. Do you remember features Wisdom Industries, which pioneered a one-truck round top Himalaya in the 1990s that gave way to the more familiar square top ride. Need a place to book, check the On the Road section, which lists the locations and dates for several dozen carnivals. The History of Train Shows follows Rubin & Cherry Exposition under the guidance of Carl Sedlmayr and Sam Soloman. The Chronicle of Wade Shows covers the use of neon on the show's midway and the relationship with concessionaire Butch Netterfield. Everyone loves a party and the surprise 40h birthday party for Castlerock Shows owner Art Gillette was no exception. The Orange and the Blue Units of Reithoffer Shows celebrated Easter on their respective midways with traditional Easter fare. Route Snapshots takes a look at California-based Brass Ring Amusements - Midway of Fun and Miller Spectacular Shows of Arkansas. Manufacturer's Showcase puts the spotlight on Ohio's Majestic Manufacturing, the company that produces an array of rides from the classic Bumper Car to the new Catch'n Air. Down Memory Lane offers a series of photos of Don's Amusements, a carnival that called St. Cloud, Minnesota, home. To celebrate CARNIVAL magazine's 40th year of publication, and in honor of the contemporary amusement industry, a pictorial tribute to the American carnival is presented. Among the carnivals that represent the modern traveling outdoor amusement industry are the following: Butler Amusements; Deggeller Attractions; Belle City Amusements; Campbell Amusements; Cole Shows Amusement Company; Mighty Blue Grass Shows; Rockwell Amusements; Arnold Amusements; Smokey's Greater Shows; Playworld Amusements; Lowery Carnival Company; Powers Great American Midways; Smokey Mountain Amusements; Michael's Amusements; Reithoffer Shows; and Ray Cammack Shows. CARNIVAL magazine's Annual Route Listings is a compilation of fifty carnivals that will be presenting a wide variety of midways across North America during the 2006 season. Contact numbers for the shows, inclusive dates for the remainder of the season, event name and locations are included. Whether looking to fill a week or an entire season, this is THE resource that can meet that need! Looking to buy, looking to sell, looking to hire, or looking for a job - be sure to check out the Classified Ads. 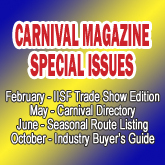 CARNIVAL magazine presents its 2006 Annual Carnival Directory. This invaluable tool is an excellent year 'round resource. There are hundreds of carnivals, large and not so large, that are profiled with contact names, addresses, phone and fax numbers, websites and e-mail addresses, along with other pertinent information. This is a great guide to booking the right sized show for any event. West coast-based Funtastic Shows has proven to be an innovative leader for the traveling outdoor amusement industry. The philosophy of one of the show's founders has helped the show reach new heights. A one-of-a-kind ride, the Huss Jumping, has a permanent home as part of the ride stable of Funtastic Shows. See how carnival rides with a strong English accent vary somewhat from their American counterparts. Teamwork played an important role at a Texas date for Alamo Attractions and Crabtree Amusements. Ride Development Corporation's portable ride called Krazy Kars is the featured piece in "Do you remember." Massachusetts has been busy implementing new regulations that dramatically affect the traveling amusement industry seeking to operate in that state. Manufacturer's Showcase spotlights the business of Rides-4-U, Inc. out of New Jersey, and Gold Medal's Sno King snow cone machine. The History of Train Shows continues profiling Rubin & Cherry Exposition following the death of show founder Rubin Gruberg. Down Memory Lane captures scenes from Johnny's United Shows. Texas-based Kenny's Funland Shows and Arizona's Desert Star Attractions are highlighted in Route Snapshots. In planning for the year, Pack Your Bags lists a number of state and industry-related events, including safety and organization meetings, slated for the next several months. Down Memory Lane offers some midway shots of Bob Hammond Shows, a carnival that was based out of Houston, Texas. The annual IISF Trade Show, held in Gibsonton, Florida, offered the outdoor amusement industry the latest in all types of products of services. Exhibitors included ride, game and trailer manufacturers, insurance providers, food and game suppliers, toys, everything needed to run a successful business in this industry. The Orange County (California) Fair achieved a new attendance record in 2005, as over one million visitors came to play. They got their thrills on the Ray Cammack midway, which also achieved record-breaking revenue. Do you remember features a dark ride called The Executioner that was manufactured by Wisdom Industries. Manufacturer's Showcase puts the spotlight on a new one-trailer Expo wheel from Roger Wadkins, who purchased the business from Bob Childress' Expo Wheels LLC. Also, just in time for the 2006 season Gold Medal Products has issued the latest edition of their FUNFOOD Catalog. The History of Train Shows continues following the Rubin & Cherry Exposition during the 1930s, a time when the carnival was faced with heavy financial problems. North American Midway Entertainment LLC (NAME) has partnered with the Mid South Fair to manage and operate the 150-year-old Memphis, Tennessee, event. The 102nd edition of the Florida State Fair offered All American Fun with its independent midway as over 15 operators stocked the midway with more than 84 rides and attractions. Route Snapshots features scenes from Kansas-based Wagner's Carnival and California's Pacific Coast Shows. The Oklahoma State Fair was OK! Wade Shows provided the midway and with good weather - for the most part - during its 11 day run, the 900,000 visitors rated it a perfect 11. Mighty Blue Grass Shows extended their stay at the Head of the Lakes Fair in Wisconsin, turning a six-day event into a ten-day run. The 2005 Mid South Fair in Memphis presented a 50-ride midway by both units of Farrow Shows, one of the North American Midway Entertainment carnivals. In addition Libertyland Amusement Park, a permanent on-site facility, offered 20 rides. During the Pennsylvania Showmen's annual meeting, Bill Sperry was recognized as that state's "Showman of the Year." Down Memory Lane features the carnival midway of Fun Fair Shows, one that promoted itself as "America's Newest Motorized Midway." "Do you remember" recalls a game titled the Roman Targets that is making a comeback with several Texas game concessionaires. After a change in the bid process for the contract, the North Carolina State Fair has signed a one year deal with a midway provider for the 2006 event. Manufacturer's Showcase features the Re-Mix II from AmTech, a new version of the popular Techno Power ride from Tivoli Mfg. Ltd. It is February and time for the annual IISF Trade Show and Extravaganza. Information on the show's schedule and a series of safety workshops that are to be offered on-site are featured. Manufacturer's Showcase provides a listing of the IISF Trade Show's hundreds of exhibitors, along with contact information and display space numbers. It was unlimited fun for everyone at the 2005 New York State Fair. Over 990,000 visitors streamed through the gates that showcased a variety of concerts, free entertainment, exhibits, attractions, and the James E. Strates Shows' midway. At the IAAPA Trade Show and Convention, every visitor could be the Star Attraction. The annual event was in Atlanta Georgia, and featured cavernous halls filled with the latest in products and services geared specifically to the outdoor amusement industry. Take a walk Down Memory Lane with Pleasureland Amusements. What do you know about this show? North American Midway Entertainment LLC (NAME) continues on its growth path, aided by Mid America Shows and Cumberland Valley Shows. Do you remember features the European ride the Super Waltzer? February 13-15 the Miami Showmen's Association is sponsoring its second annual Industry Safety Seminar at the group's clubhouse in Fort Lauderdale. The program is designed to meet the needs of those directly involved in the traveling outdoor amusement industry. Recognizing a commitment to excellence in their operations, the OABA recently awarded their Circle of Excellence to 21 members of the amusement industry. Making a strong charge into their second century is the W. G. Wade Shows. A history of the carnival that started with a Merry-Go-Round taken as collateral is presented. Route Snapshots visits the midways of Playland Amusements and Midway Rides of Utica, both of which bring fun zones to many events in New York State. In planning for next year, Pack Your Bags lists many of the annual state association meetings and industry-related organization meetings that are slated for the next several months. In the Now Booking for 2006 section, check out the carnivals and concessions that may be available for booking your event. Also included in this issue are regular features: Midway Talk, Direct From the Lots, Life's Flow, and Modeler's Corner. CARNIVAL magazine is celebrating 40 years of providing information to the outdoor amusement industry. A CARNIVAL Gallery features some of the bright and colorful covers that have graced the publication. Despite a multitude of problems in the area, the "show must go on" mentality was demonstrated at the 2005 Louisiana State Fair, which had a successful run, achieving a respectable attendance of over 350,000. The year 2005 was one of strong growth for Powers Great American Midways, with the addition of new contract dates and rides. The 2005 Arkansas State Fair was better than "fair" as evidenced by its record attendance. Swank's Steel City Shows supplied the rides at the Bedford County Fair in Pennsylvania, an event that in the past has featured the midways of Cetlin and Wilson Shows, Dell and Travers Shows, and Olympic Expositions. Manufacturer's Showcase puts the spotlight on National Ticket Company's two new sales offices. Also presented are two new rides from Fabbri Amusements: the Flying Swing and the Boinger. Exotic animals at a fair are always a draw and putting a new twist on that is Zoo Dynamics with their educational tiger display. Do You Remember features the Wet-N-Wild, a one-of-a-kind ride built by Wisdom Manufacturing. The History of Train Shows continues following the route of Rubin & Cherry Exposition, focusing on staff changes and independents that booked with the show. Stop by the breezeway and say hi!